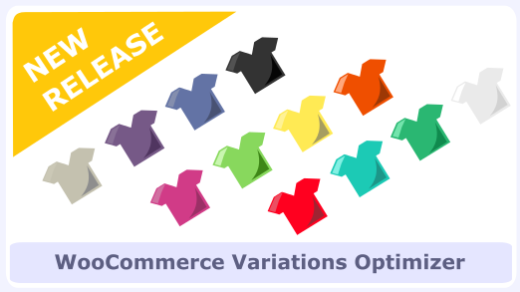 We have released a major update for our premium plugin “WooCommerce License Keys (Extension)“, version 1.1 (v1.1.1 official release), which brings a ton of new features that will make its users very happy. My account page (theme Easy eCommece) displaying license key available actions. 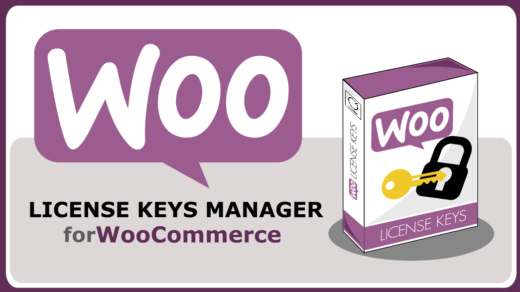 Customers can extend and or renew their existing license keys with the click of a button on my account page (page provided by WooCommerce). Displaying license key actions in my account (theme Easy eCommece). 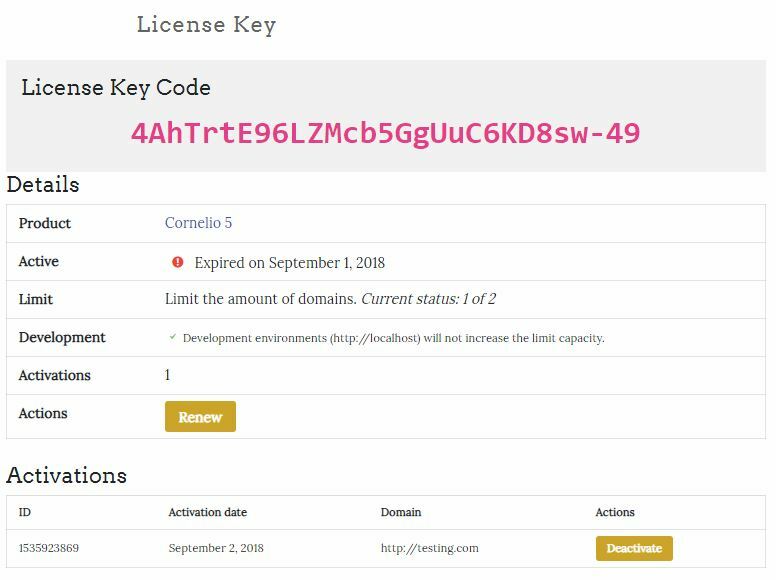 When a customer decides to renew or extend a license key, the extension or renewal is added to the cart the license key product highlighting the action and license key code that wants to be purchased. The product is added with the price set at the time of the re-purchase. Cart displaying a license key renewal (theme Easy eCommerce). When the order is completed, customer will receive the license key information like a regular license key product. License key extension notice displayed on admin order page. 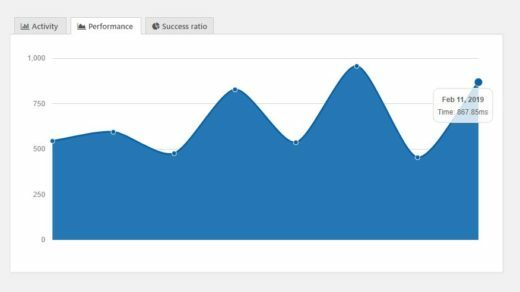 A notice will appear above the license key renewed or extended when reviewing or managing an order in WordPress admin dashboard. The admin will also receive an order note indicating the changes made to the expiration date. In addition to the manual process and set of actions given to the customer; admins can now add automatic notifications that will inform customers when their license keys are close to be expired. Notifications are set on the product’s admin form; admins can choose to set the product to by notified multiple times in different periods of time. Notification options on product form page. 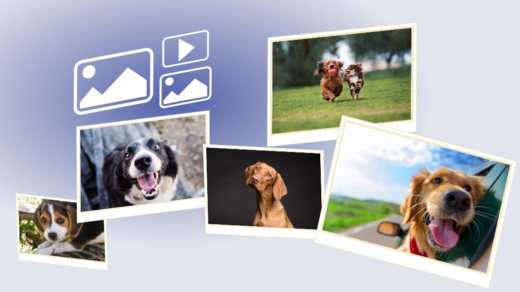 In the picture above, the plugin will notify the customer 2 times, one time a 1 month prior expiration and a second time 7 days prior expiration. The plugin uses WP Cron to automatically send the notifications, so be sure to have it correctly configured on your web site (we suggest to follow these steps). 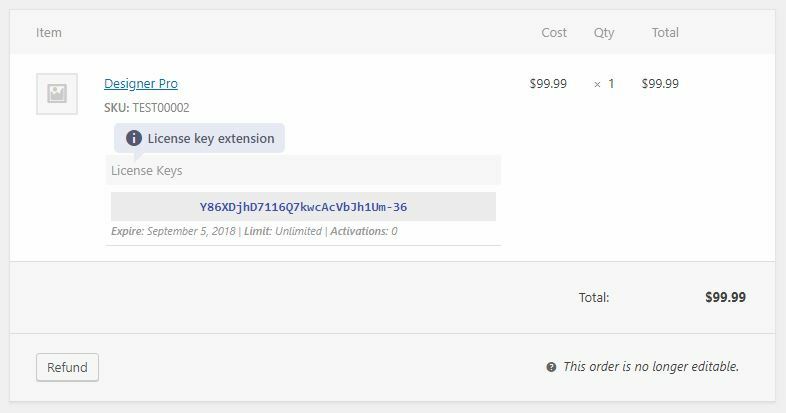 The email sent to the customer will inform them about the expiration and will give them the option to renew the license key with a click of a button (which adds an extension to the cart so they can proceed re-purchasing the license key). Date picker while editing license key. 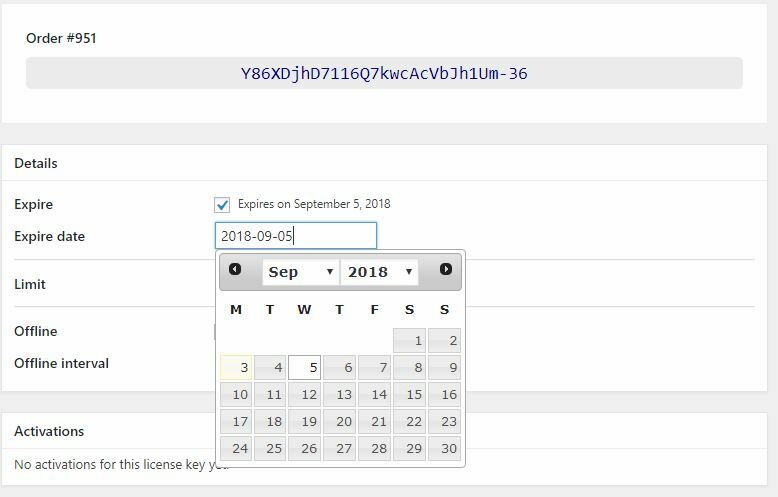 A much needed date picker has been added to facilitate the management of existing license keys. 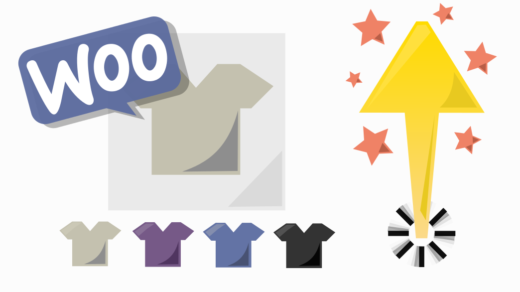 Localization functionality and spanish translations has been added. Renew / extend existing license keys support. Renew / extend action options on my account page. License key actions displayed on cart. Renew / extend information displayed on admin order page. 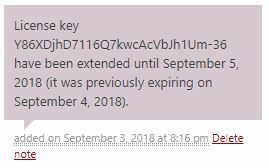 License keys expiration notifications via wp-cron. Contact us if you have any suggestions or questions in regards of this release, and or share your comments below.